Juniper Hill Condo is a freehold development property situated in the affluent District 10. It is well located at Ewe Boon Road at Singapore next to plenty of amenities. 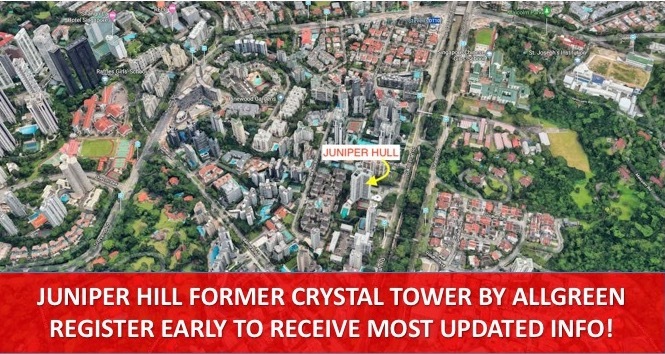 The Juniper Hill condominium formerly knows as Crystal Towers was constructed in 1974, recently enbloc by Allgreen Properties, in a collective sale amounting to $180.65M, a bid above the asking price of S$138m translating to S$1,406 psf ppr. Owners of Juniper Hill Condo are expected to walk away with at least $6m. 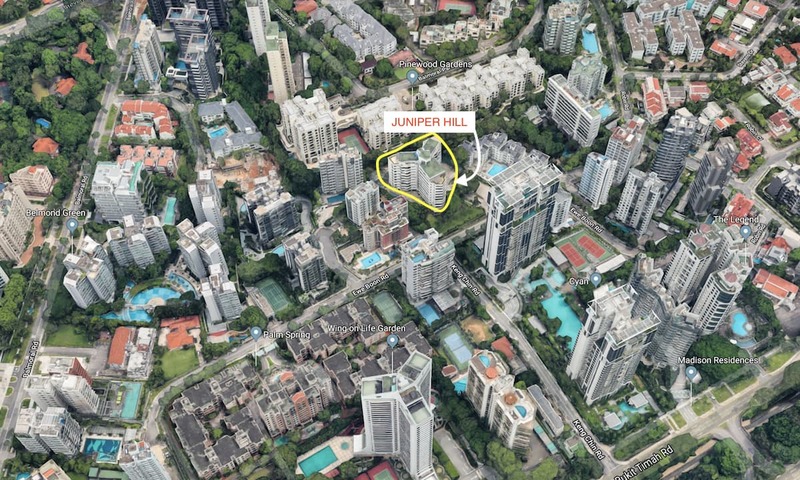 Owners of Juniper Hill Condo asked for S$138 m that translate to a plot ratio of S$1,406 psf ppr according to its GFA. Juniper Hill Condo is sited in a land size of around 60, 482 sq ft and is set for residential development with a GPR of 1.6 in the Master Plan 2014. Its break-even price is expected to be around S$2,400 – S$2, 500 psf. The upcoming Juniper Hill Condo will feature up to 115 units with ample in-house amenities and constructed with modern architecture. Each of the units comprises of three bedrooms, a master bedroom, attached bathrooms, and a kitchen. Has an average size of 2700 sq ft with 4 spacious bedrooms which make them suitable for mid to large families. Its strategic location within Bukit Timah in District 10 offers excellent convenience and residents of Juniper Hill Condo ill easily access Orchard Road shopping center alongside other great destinations like Dempsey Hill and the Singapore Botanic Garden. AllGreen Properties won, in a competitive bid that included 12 bidders. It is a reputable company that has enough resources to see the completion of the Juniper Hill Condo. Considering that, Juniper Hill Allgreen is also located in a developed area that features notable developments and facilities, buyers will appreciate living in the area. Are you looking for the best place to make your home? Look no further than Juniper Hill Condo in Bukit Timah. It’s no doubt that everyone wants to live in an area that offers excellent connectivity with unlimited amenities all packed in a quiet neighborhood. Well, this is what you get if you purchase a unit at Juniper Hill today. What makes Juniper Hill amazing? Whether you are a family person or planning to have one in the future, here are the top reasons why Juniper Hill condominium should be your next home. When looking for an outstanding place that you can make your home, its location should be at the center of all other factors to consider. With an excellent site that allows you to access nearly everything that you will need for day to day activities, Juniper Hill Condo offers you incredible residential units that will make your stay more comfortable. Bukit Timah area is among the best places to stay in Singapore that boasts of a ray of social amenities that will serve Juniper Hill Condo residents as well as people from the neighborhood. The attractive Jacob Ballas Children’s Garden, National Orchid Garden, and Singapore Botanic Garden are found just a few minutes drive from Juniper Hill Condo. Get to experience an amazing view of the Botanic Garden as you view the Swan Lakes and tropical trees. Health facilities and vibrant shopping destinations are situated in the corner which makes accessing them pretty simple. Juniper Hill by Allgreen is surrounded by significant roadways like Balmoral Road, Ewe Boon Road, Keng Chin Road, Dunearn Road, and Bukit Timah Road which enables residents of the nearby areas to access the city easily. Additionally, Juniper Hill sits close to Newton MRT Station, Stevens MRT Station, and the Orchard MRT station. This means that future residents of Juniper Hill Condo will enjoy easy access to anywhere around the city. Considering that it is next to a busy commercial hub, market, and schools, residents can easily access taxis and local buses just a few minutes walk from Juniper Hill. Buona Furthermore, Newton MRT Station and Buona Vista MRT alongside several bus services provide outstanding accessibility to other parts of Singapore. As a parent, educational concerns of your children should top on your list of factors to consider when seeking for a residential place. However, if you pick Bukit Timah, then you don’t need to worry because it is packed with excellent schools that you will definitely like. The schools are found just a few minutes drive from Juniper Hill Condo ranging from primary, secondary to tertiary level institutions. This means that you will always find the right school that suits the educational needs of your children. Additionally, the transportation cost is reduced since the schools are close to Juniper Hill Condo Residences. Since Juniper Hill Condo is sited next to these schools, it is an ideal residential property for families to settle. If you are a shopaholic, then Juniper Hill Condo has a place for you. This is because Juniper Hill Condo is situated next to shopping malls and other major shopping centers. Apart from access to essential commodities, shopping malls are a good source of entertainment. Various events happen in the shopping malls which makes it a great place to spend some quality time with friends and relatives. Restaurants can also be found in the shopping malls which offer you a variety of food. The shopping centers also offer entertainment, saloon, boutique services and more to the residents of Juniper Hill Condo and the entire Bukit Timah area. When you need to access a restaurant, be eat to dine with your friends or family, there plenty of restaurants around Bukit Timah that you can visit. Holland Village situated next to Buona Vista MRT Station is a famous food haunt that most expatriates and Singaporeans like. Also known as “Holland V” it offers you some of the best foods that you will hardly find anywhere else in Singapore. Furthermore, you won’t need to cover long distances to access your favorite cuisine. If you live at Juniper Hill Condo, Visit Holland Village to experience perfect dining in a classy restaurant. Some of them include Scotts 27, Cedele All Day Dining, The Dining Room, Kuriya Dining, and Sun with Moon Japanese Dining & Café. Bukit Timah area is among the best places to stay in Singapore that boasts of not only social amenities that will serve Juniper Hill Condo residents, it also offers a beautiful scenery of the neighborhood. The attractive Jacob Ballas Children’s Garden, National Orchid Garden, and Singapore Botanic Garden are found just a few minutes drive from Juniper Hill Condo. Get to experience an amazing view of the Botanic Garden as you view the Swan Lakes and tropical trees. Health facilities and vibrant shopping destinations are situated in the corner which makes accessing them pretty simple. Are you looking for an investment opportunity in Singapore? If yes, then one of the best places to consider is the Core Central Region (sometimes terms as CCR). According to researches, the area has exceptional performances when it comes to the growth of real estate. To shed some light on why you should consider investing in this area, here are the reasons why you should invest your dollars in a Core Central Region. Unlike other properties, condos such as Juniper Hill Condo attract more buyers with a huge resale value. What does this mean to you as a buyer? Juniper Hill Condo and other properties in Core Central Region adds value to your investment and you are guaranteed of high resale value when you sell it in future. According to data from a property management company here in Singapore, the resale price index for condo units found in the core central region is at 1.8% as compared with other areas showing a decline. Residential properties situated in the core central region enjoy easy access to amenities which makes the properties attract many buyers. If you need good access to facilities, then you should consider Juniper Hill Condo and such other residential units in Core central region. Living here means that you won’t have an easy time accessing healthcare facilities, schools, recreational and holiday facilities. The area is one of the best places to live in Singapore as it offers excellent accessibility to nearly everything you will need during your stay. In the past, areas such as OCR and RCR suffered excess loss caused by a reduction in prices as a result of an oversupply of residential properties in real estate. However, CCR was least affected. So, by owning property in this area such as Juniper Hill Condo, you can be sure of capital appreciation and high resale value when you are ready. A high percentage of residents of the Core Central Region are foreigners and expatriates, and if you make a purchase today at Juniper Hill Condo, then you will get to interact to them around the neighborhood. The main factor that attracts them is the availability of many industries in the area. It presents to you an opportunity to do business in next to different companies and government agencies as you live in the midst of expatriates. There is no doubt that the Core Central Region is an excellent destination in Singapore for improved living standards. If you are looking for a residential property to make your home, then Juniper Hill Condo by Allgreen is indeed the best place to stay. You will hardly find the opportunities that this region offers in other parts of Singapore. Bukit Timah is situated just a few distances away from Orchard Road, providing the residential properties around an exceptional lifestyle and recreational option to future residents of Juniper Hill. If you are planning to stay in Singapore, then there are plenty of reasons to consider this area. With several development projects under the URA master plan planning, Bukit Timah is set to offer unmatched lush green spaces, excellent transportation network and various amenities to make a living in the area more comfortable. The URA Master Plan will see the development of a wide-range of facilities that will ensure that the future residents of Juniper Hill meet their needs. These facilities will range from schools, shops, sporting facilities and more which are quite essential in ensuring that an efficient and livable residential area is achieved for Singaporeans to enjoy. Furthermore, the facilities are conveniently distributed around Juniper Hill to allows good accessibility that will also be enhanced by the efficient transport network. If you are looking forward to making Bukit Timah area your home, you must be concerned with the URA Master Plan. How will it make the area vibrant? Here are some of the ways that The URA Master Plan will benefit the future residences if Juniper Hill. Although Bukit Timah is a well-established area, the plans will see the development of the area to provide Singaporeans with quality and affordable homes. In the plan, various housing options will be developed that will contribute to the landed homes and condominiums present in the area. These housing properties continue to make Bukit Timah a choice estate to many Singaporeans. The URA Master Plan also lays strategies that will restore the appealing charm of Bukit Timah being home to prominent buildings like the Bukit Timah Railway Station and Former Raffles College which is made up of six buildings in the NUS Bukit Timah and other heritage areas that adds amazing flavor to its surroundings. Bukit Timah Turf Club, Dempsey Hill, and the Former Phoenix Park areas which have been renovated and adapted for interim purposes like F&B, recreational and retail shop uses. The local community node situated at Anak Bukit is set to be connected by the upcoming Beauty World MRT Station. This station will also serve public spaces or the outdoor community, and the new pedestrian mall. There are plans to develop an extensive walkway that will connect the station with Food Centre and Bukit Timah Market, including eating spots at Cheong Chin Nam Road. In any residential area, transport is fundamental to ensuring that the residents are well connected be it to community facilities, leisure, education or workplaces. In almost everything we do, transport is involved and an excellent transportation network open way to opportunities increasing the value of living in a certain place. With the upcoming enhancement of transport in Bukit Timah, residents of Juniper Hill and the surrounding areas are set to benefit in a great way. It’s no doubt that the economic success of any residential area is dependent on how well connected, attractive and integrated the transport system is. So, if you ate looking for the best place to live or invest, this part of Singapore is an ideal place. The convenience that surrounds the area ensures that the future residents of Juniper Hill will get good quality and enjoyable experience living in Bukit Timah. It also ensures that you will get to where you want whenever you need to whether you own a car or rely on public means of transport. In short, if you make Juniper Hill your home, then you will enjoy nothing but a smooth and short journey. Furthermore, traveling from Bukit Timah to other prominent parts of Singapore is made easier and faster with the incredible transport system. There are multiple stations developed which have improved transportation in the area from Stevens Station to Beauty. The World Station situated along the Downtown Line 2 commonly, that was launched in 2016 provides the residents of Juniper Hill an excellent connection to the Marina Bay area and the Central Business District. The resent Botanic Gardens Station is an interchange that will serve the Circle Line and DTL2. Additionally, among the six upcoming MRT Stations, Napier and Stevens along the Thomson set to be launched by 2021. Once completed, Stevens Station will operate as an interchange with DTL2. The completion of upgrading program of Clementi Road, Ulu Pandan and the Pan Island Expressway will also ease traffic flow in the area. Recreational parks and facilities are an important part if any residential area. Lucky for the future residents of Juniper Hill, Bukit Timah area has a place for them to do their workout, get healthy and maintain their body in good form. Furthermore, parks are important since they protect groundwater, improve water and the quality of the air we breathe. It also provides a place where you can visit with your children to spend some quality time. Additionally, Bukit Timah area stands out by its green surrounding with a range of leisure and recreational facilities that the future residents will enjoy. These developments projects will improve the quality of life for the residents which makes it an incredible place to spend your time. The Rail Corridor that provides the future residents of Juniper Hill a green setting for cycling, jogging walking among others. There are plans to convert the canal at Maple Lane to become a linear park, linking other parks at Garlick Avenue and a good connection to the Ulu Park connector. The enhancement of Bukit Timah 1st Diversion Canal that entails beautiful landscaping as part of Clean (ABC) Waters program, Beautiful and PUB Active. Tyersall Learning Forest is another development that features a 9.8ha of forest habitats boasting of a tropical forest with treetop walkway, marshland with tropical wetland plants and with giant Tembusu trees. The URA master is a land use plan enacted by the government to guide the development of properties and land in different parts of Singapore such as Bukit Timah in a period of 10 to 15 years. It ensures that land is well used to make a living in those areas more comfortable. This is why future residents of Juniper Hill will benefit a lot from this Master Plan in the Bukit Timah area. When looking for the best place to live, access to basic amenities and facilities should form the basis of the factors to consider. This is why you need to buy a unit at Juniper Hill Condo since it offers you everything that you need to make your stay better. So, why not register now for Juniper Hill today to avoid missing out this rare opportunity of living in Singapore’s finest residential area?